Sometimes I put on an outfit that feels extra trendy. And this is definitely one of those times. Because, Hunter boots and Zara scarf. Two very loved fall items! 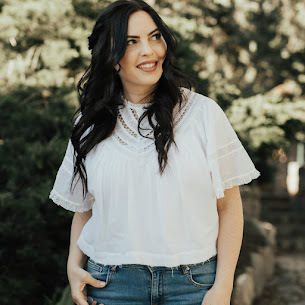 I usually air on the side of not so trendy, but I do happen to love these two pieces! This season, Zara came out with the blanket scarf I'm wearing and I looooove the colors. So I'm not wearing THE scarf that everyone can't get enough of, but I almost love this one more. And since I get this question allllll the time, I got these Hunters at Costco last year for less than $80! I bought them online, and sadly I haven't seen them available online this year, but I've heard you can still find them in stores on occasion! They are regularly priced at Costco for $79 and they are the exact same boots as the ones you get at any other retailer. I'll be keeping my eye out for you guys! Hope you all had a lovely weekend! We did some cookie baking, ikea shopping (for new baby's nursery. Yay! ), and pizza eating in Salt Lake (sans child) and it was a most glorious time. A happy Monday to you all! Okay tell me what is so great about hunter boots? I have tried rain boots before and they are sweaty and hurt my feet. Are these different? Wonderful Fall look - I am inspired to add a scarf like yours to my wardrobe! Thanks for sharing with Visible Monday. Very cute! Such a sweet fall look, those boots are fab. I have to got myself one of these blanket scarves. Love how you styled it here and score on the Costco boots! You sure did get those boots for an awesome price. Oh man I love that scarf so much! Cute outfit! These items are all really trendy, but what matters is that you made a complete and put together outfit with them. Totally loving that scarf girlie. love this casual outfit! perfect for weekend! Looking great Janelle. I hope you are feeling well, too. Love the scarf, the boots and the vest. I want all 3 pieces. I'd wear this outfit in a heartbeat, during a mild-to-warm Fall day. You are too cut! 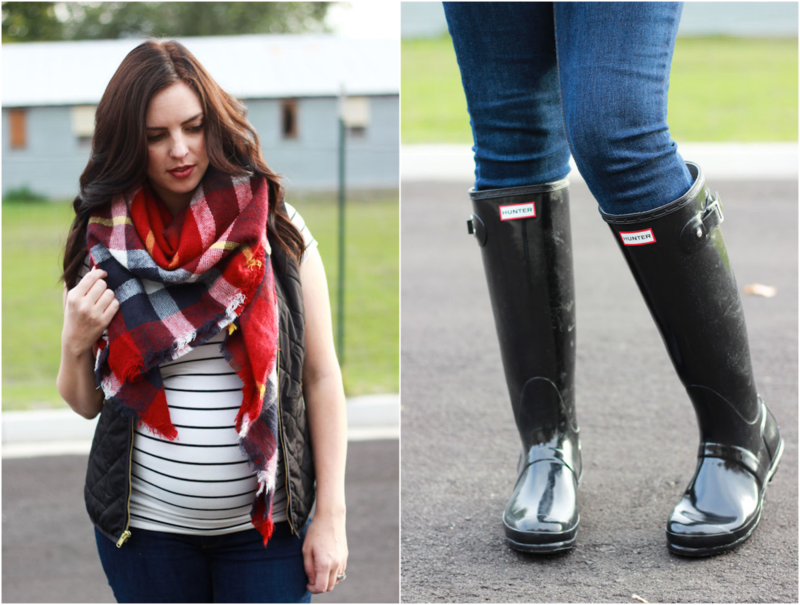 I love your scarf and your hunter boots together, not to mention your stripes, which I am obsessed with! So cute girl! Love this Janelle! Looks super cute and practical for pregnancy! That scarf is gorgeous!! I love it with the stripes. Your scarf is gorgeous, and drapes so perfectly. Great outfit! 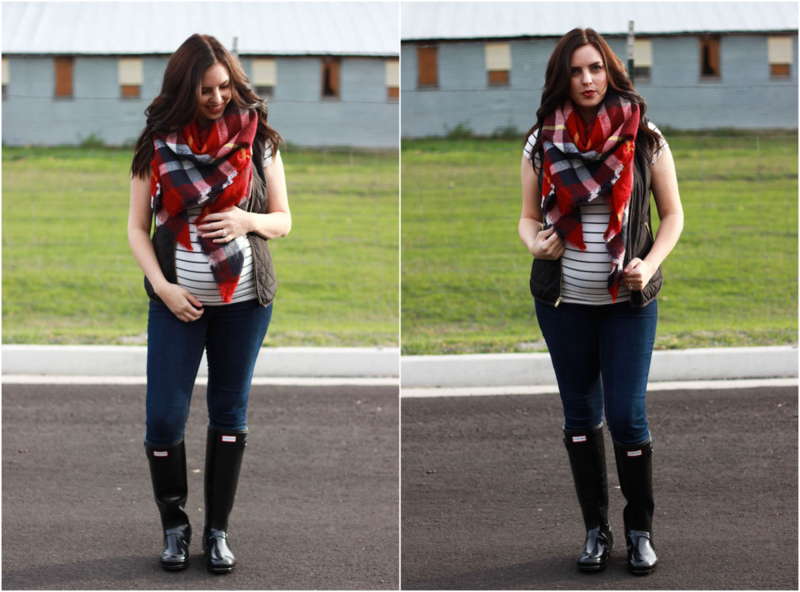 Love the scarf- perfect for fall and winter!